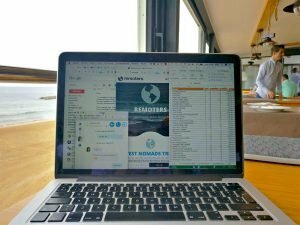 One of the hardest things for a remote worker to do is give up their 27-inch desktop computer screen. It’s even harder if you’ve started using two screens or even three. When you need a spreadsheet, a website, a chat window, and your social media feed open all at once, the idea of working from a laptop screen may seem daunting. Some may be tempted to sacrifice laptop weight for the largest screen size available. But the extra weight isn’t worth an extra inch or two—there are other options! Renting a display in your destination is the simplest thing to do to maximize the screen space on your tiny but lightweight computer. Many coworking spaces have displays available for rent by the day, by the week, or by the month. If you are staying in a coliving/coworking situation, you may find that displays are available for shared use at no extra charge. If you can’t rely on a rental, you can always bring your own display. A portable laptop display, likes those from AOC and ASUS are thin, lightweight (most about 1 kg or less), connect through a USB cable. They are also relatively inexpensive. In their protective carrying cases, these laptops lay flat in a suitcase or slide into the laptop sleeve of your tech bag. The up-side of a portable display is that you’ll always have it. The down-side is that you’ll always have it! Also, users have reported that setting up one of these at eye level can be tricky—you may need to scrounge for books, boxes, or yoga blocks. And there is a risk that they may tip over and break. If you don’t have the space for a full screen, consider the tablet option. Tablets are getting both larger and lighter every year—the 9.7-inch iPad weighs less than ½ kg; the new iPad Pro comes in 10.5-inch and 12.9-inch size, still well under 1 kg). For years veteran digital nomads have used tablets as extra screens alongside their laptops. But now you can use an app to extend your laptop’s screen, just as you would with a desktop display screen. Duet Display for iOS and iDisplay for Android are two screen-extending options. If you go with the tablet option, consider a device like the Mountie, which clips a tablet or phone to one side of a laptop screen. As a digital nomad, you’ve probably broken free of the TV culture. But, TVs are standard in hotel rooms, rental apartments, and even some beach bungalows. With an HDMI cable, you can hook up your computer to most TVs. The screen may not be easy on the eyes but it does let you open several windows at once. You may also need to move the furniture around to accommodate your cable length. You should always travel with an HDMI cable that connects to your laptop. Borrowed or rented displays may not include the cable you need. And even if you don’t need to work on your accommodation’s TV, you can use your HDMI cable to stream video on a larger screen. Are you working on a small laptop screen? Have you tried one of these solutions?